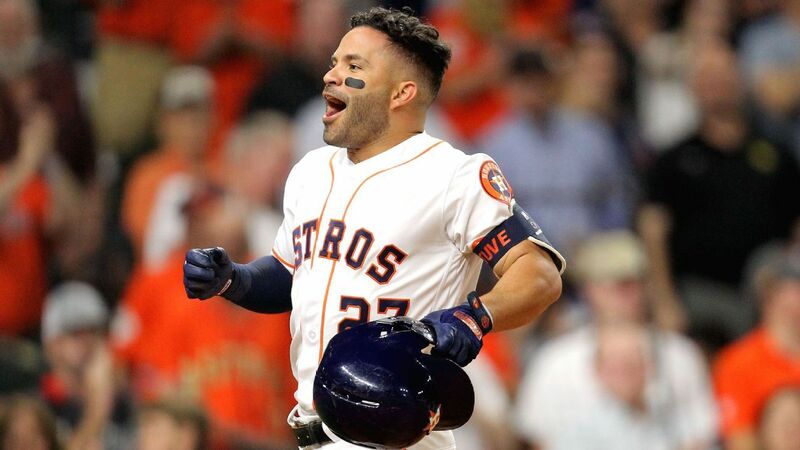 There were some thoughts heading to the 2019 season that we had seen the best of Jose Altuve. The consensus view after a 2018 season in which he hit .316 with 13 home runs and still finished 13th in the MVP voting: still and excellent player, but probably no longer and MVP candidate. Nobody on ESPN's panel picked him to win the award. • Altuve became the first hitter to homer twice off Paxton in the same game. • As Astros beat writer Chandler Rome tweeted, both home runs had exit velocities of 108 mph. Altuve had just five balls in play last season of 108 mph or higher. After hitting 24 home runs in both 2016 and 2017, Altuve didn't have last season until his 26th game. Still, he was hitting .342 / .407 / .483 at the end of June, started his fourth straight All-Star Game and looked like a good bet to maybe win his fourth batting title. Somewhere in there, he hurt his knee. He hit .276 the final three months and we saw him limping around in the postseason. He even had DH game in the AL Championship Series. If he can stay healthy, it looks like we still have MVP candidate Jose Altuve. That's huge for the Astros considering their offense scored 99 fewer runs in 2018 than in 2017. As for the Yankees, they fall to 5-7. Paxton has dominated Houston in the past, but the Astros had a good plan against him, fouling off 26 pitches and running him out of the game after four innings and 95 pitches. Tommy Kahnle then made up a two-run homer to Carlos Correa. New York rallied with four runs in the eighth and had the second run with no outs but left him stranded, then Zack Britton allowed an insurance run in the bottom of the inning. The vaunted bullpen gave up nine runs in the series and Yankee starters haven't been deep in games. Glasnow has started the season firing on all cylinders, continuing the buzz he created over the final two months of last season, when he looked good after coming over from the Pirates. He's 3-0 just one run in 17 innings (and Alex Bregman home run) and has dominated with both his fastball and offspeed stuff. He has thrown the fastest pitch by starting this season at 100.4 mph, but nine of his 11 strikeouts on Wednesday came with his curveball or slider. Most importantly, he's not walking batters, with just three against 21 strikeouts. How good does that Chris Archer trade look now? Austin Meadows went 3-for-5 on Wednesday with his fourth home run and is now hitting .341 / .420 / .659. It's early, but it's possible that both Glassnow and Meadows will outperform Archer this season – and the rays will have Glassnow under team control for five seasons and six for six, while Archer is signed through 2021. The rays also received pitcher Shane Baz, the Pirates' first-round pick in 2017. It's the kind of trade that can push a small-market team like the rays to the next level and the child of trade that can potentially cripple a small-market franchise like the Pirates. To be fair, it's understandable why the Pirates made the deal. They had been able to extract the most out of Glasnow's high-ceiling talent and had been using the bullet after he posted a 7.69 ERA as a starter in 2017. Meadows, meanwhile, had never put it all together and had injury issues throughout his minor league career. Still, peak Archer had come in 2014 and 2015 and he has a 4.09 ERA since 2016. He is a good pitcher and will help the Pirates, but five years from now we might look at the hit as one of the key building blocks for the 2019-2024 Rays Hit Merrifield: Before Whit Merrifield came along, the most famous "Whit" in baseball was probably Walt Whitman, who once wrote, "I see great things in baseball. It's our game – the American game. It will take them out-of-doors, fill them with oxygen, give them a larger physical stoicism." Anyway, Merrifield extended his hitting streak to a Royals franc his record of 31 games, breaking a tie with George Brett with a perfect, two-out bundle single down the third-base line in the seventh that also included the game, scoring Terrance Gore from third base. The Royals game got really interesting in the ninth. First, Mitch Haniger homered with two outs off Brad Boxberger (Diamondbacks fans need their heads) to give the Mariners the 6-5 lead and extend their season-opening streak to 14 games with a home run. (19659002) Cardinals extend Matt Carpenter: The Cardinals announced the signing of the three -time All-Star to a two-year extension that covers 2020 and 2021 at a reported $ 18.5 million annual salary with a fortress option for 2022 if Carpenter accumulates 1,100 plate appearances in 2020-21, including at least 550 in 2021. Carpenter had already been signed through 2020, so this deal guarantees him another season in St. Louis beyond that and probably two unless he suffers from a significant injury. He is not quite as famous – and has as many rings – but the case of the Astros shares some parallels with the Pats QB and aspires to play, well, forever. Already playing with an injury-wracked roster, the bombers have added to their problems at letting two close games slip away. Carpenter finished ninth in the MVP voting in 2018 after hitting .257 / .374 / .523 with 36 home runs, 42 doubles and 102 walks. Since his breakout season in 2013, only Mike Trout has scored more runs. Of course, with Paul Goldschmidt now signed through 2024, this locks into third base through at least his age 35 season (and 36 in 2022). When the Cardinals acquired Goldschmidt, there were some concerns about Carpenter's ability to play third base, but he has always been adequate there with minus-3 defensive runs saved in his career there, including plus-6 in 76 games in 2018. He might slip But I wouldn't foresee a defensive disaster over there. Looks like a good player for a valuable player. The last time a team walked or hit seven consecutive batters was 1994, when Mariners started Dave Fleming walked five Yankees in a row and reliever Jeff Nelson hit a batter and walked two more for eight in a row. 19659002] The Mets held on for the 9-6 win as Noah Syndergaard tired in the eighth and allowed three runs and then Mickey Callaway, not trusting the rest of his bullpen, was forced to use both Jeurys Familia and Edwin Diaz as they head to Atlanta on Thursday without an off day.